Airwars tracked 128 civilian casualty events in Iraq and Syria in August, by our estimate likely killing between 470 and 719 civilians. The majority of these events occurred in Syria, where SDF advances into the city of Raqqa came at significant cost to civilians. The sharp increase in likely civilian fatalities coincided with a record number of munitions released. The Coalition fired ten times more munitions on Raqqa alone last month than were released by US aircraft across all of Afghanistan. The impact of this ferocious bombardment on civilians trapped in the city was reportedly devastating. Likely deaths more than doubled on July’s minimum estimates, to their highest levels yet – with between 433 and 643 civilians likely killed in Raqqa alone, according to our present assessment. Civilians in Iraq finally experienced some respite, with a 25% fall in reported casualty incidents – and a substantial decrease in the number of deaths assessed as likely. After just eight days of fighting, the northern city of Tal Afar was captured by Iraqi forces in August, demonstrating ISIS’s diminished power since the fall of Mosul. Pre-battle warnings by the Iraqi government that up to 50,000 civilians were still trapped in the city proved incorrect. The assault on Tal Afar therefore proved less complicated than the battle for Mosul, where a large number of non-combatants had remained. Meanwhile, August saw the lowest number of Syrian events attributed to the Russians in any given month since the start of their bombing campaign in 2015. Just 36 incidents were linked to Russia in August, 45% down on those monitored during July. That falling number highlighted the growing disparity between alleged Coalition and Russian actions. August 2017 was the eighth straight month that Russia’s campaign in Syria had been overshadowed by casualty events reportedly carried out by the US-led alliance. As of August 31st 2017 some 13,568 air and artillery strikes had reportedly been carried out in Iraq – and 12,426 in Syria – since the start of the Coalition campaign against so-called Islamic State more than three years earlier. In Iraq 292 strikes were declared, an increase of 30% from July. Strikes in Syria saw a 51% increase on the previous month with a total of 1,463 strikes reported. This marked a new all-time high. August also saw the highest number of munitions released in any one month since 2014. According to official data published by US Air Force Central Command, the Coalition’s declared active members (the US, UK, France, Belgium, Australia and Jordan – along with possibly Saudi Arabia and the UAE) released a total of 5,075 munitions during air raids on ISIS targets in August. This was an 18% increase on July’s figure. Separate munitions figures provided to Airwars by the Coalition are even higher than those published by AFCENT, because they also include HIMARS rockets, helicopter attacks, and US Army and Marine Corps drone and artillery strikes. 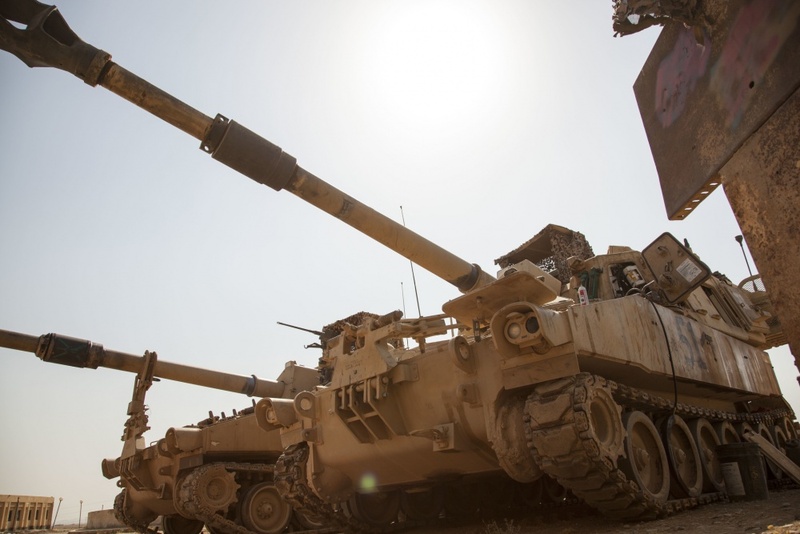 The Coalition reports that it fired approximately 8,187 munitions between Iraq and Syria during August – some 1,843 in Iraq and 6,344 in Syria. At Tal Afar, during a short campaign to oust ISIS, 1,238 munitions were reportedly released. Raqqa bore the brunt of this dramatic hike in munitions released. The Coalition reported that a record 5,775 bombs and missiles were fired in support of operations to capture the city – a 92% increase on July. This figure is 5% higher than the peak munitions fired on West Mosul back in March, to date the deadliest month for civilian harm tracked by Airwars across the entire war. Those 5,775 munitions fired at Raqqa were also more than ten times the declared number of munitions released by US aircraft in all of Afhganistan during August – which was itself at a five-year high. Moreover, those record Coalition munitions were fired into a small geographic area. Raqqa covers approximately 40 square kilometers – less than half the size of West Mosul. It was reported that some 2,000 ISIS fighters still remained in Raqqa city by August 6th, who were using as many as 20,0000 civilians as involuntary human shields. As reported in detail below, this had a devastating impact on non-combatants. Actions carried out by the UK in Iraq continued to fall. The MoD reported just eight strikes in August, a decrease of 65% on the previous month. France reported 14 Iraq strikes, up from 11 in July. 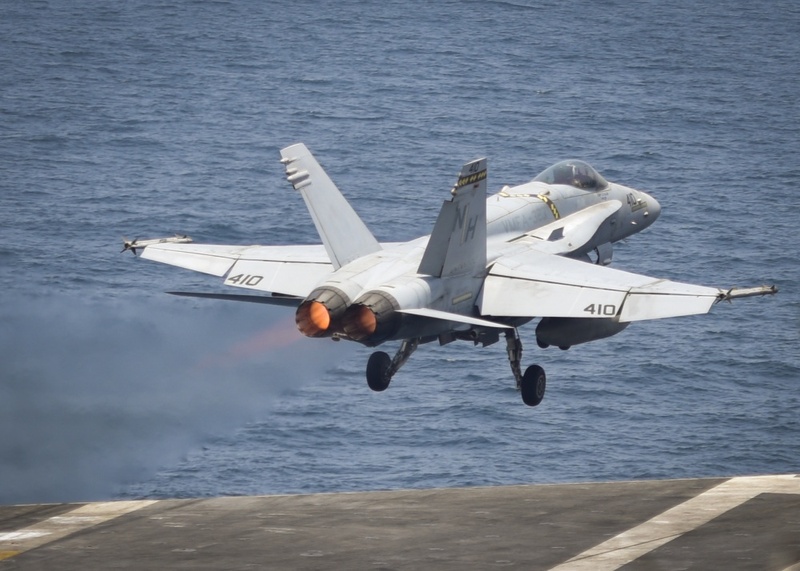 Australia for the first time reported the greatest number of non-US actions in Iraq, with approximately 31 strikes throughout the month – most of them at Tal Afar. Although there was also a decrease of 21% in UK actions in Syria, 31 strikes were nevertheless reported – most concentrated at Raqqa. French actions in Syria remained steady with 16 reported strikes, just one more than in July. 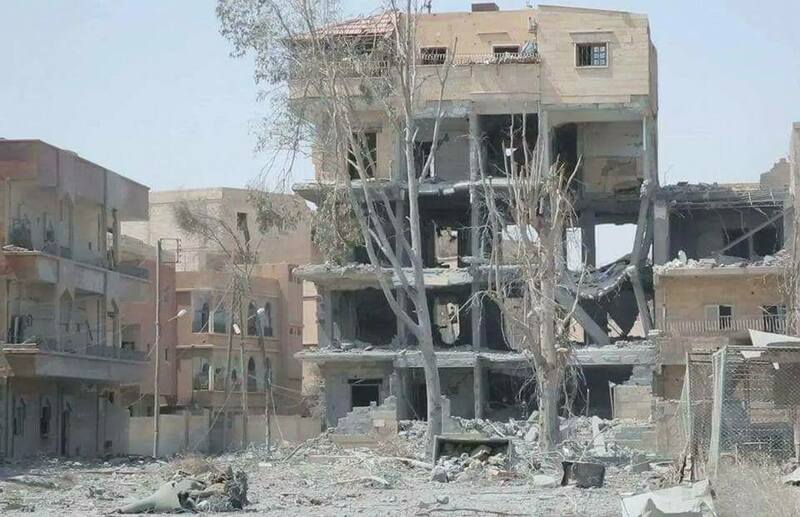 At the start of August the SDF – supported by intense Coalition strikes – seized control of large parts of the Hisham Ben Abel Malik neighbourhood in Raqqa and tightened its siege on the ISIS-held centre of the city. The humanitarian situation remained dire, with thousands of civilians still trapped in ISIS-held territory without access to food, water or vital medical supplies. In response, ISIS reportedly opened the way for 3,000 civilians to leave some areas where clashes had worsened. Yet reports also continued of ISIS firing on civilians as they attempted to flee the city. By August 8th, the SDF had largely driven ISIS from southern Raqqa, though violent confrontations continued. More gains followed and by August 29th, ISIS was said to control just 10% of the Old City, which they nevertheless held on to with fierce resistance. Meanwhile in Iraq, the battle for Tal Afar was officially announced on August 20th. Iraqi Forces made rapid gains and by August 24th had encircled ISIS fighters in the heart of the city. Just one day later on August 25th, Iraqi forces said they had broken through ISIS lines and now had control of the old city centre. By August 27th Iraqi forces declared that they had completely recaptured the city. The entire campaign lasted just eight days. During August likely civilian deaths from alleged Coalition strikes in Iraq and Syria increased by 35% on July’s minimum estimates. With non-combatants increasingly at risk in Syria, August was the third deadliest month for civilians since the start of Coalition actions in 2014. One August trend was particularly concerning: more civilians were credibly reported killed in fewer casualty incidents, with our researchers tracking a number of larger scale events assessed as likely carried out by the US-led Coalition. Across both Iraq and Syria, Airwars tracked 128 reported civilian casualty incidents – a 34% decrease on July. Of these 128 events, we currently assess 74 as fairly reported. This categorization means that an incident has two or more uncontested sources, and that the Coalition has confirmed carrying out strikes on the same date in the near vicinity. Airwars’ current assessment is that between 470 and 719 civilians were killed in these incidents – compared to a minimum of 349 likely deaths in July. The raw overall alleged toll from Coalition actions during August in Iraq and Syria – across all incidents assessed as ‘fair’, ‘poor’ or ‘contested’ – currently stands at between 1,092 and 1,988 claimed civilian fatalities. As the Coalition-backed onslaught on ISIS’s de-facto capital of Raqqa intensified, in August Airwars tracked a 57% rise in deaths assessed as likely caused by the Coalition in Syria. Consequently, likely civilian deaths during the month reached record levels. Yet even as evidence from multiple sources mounts of a high civilian toll – as previously reported by Airwars – the Coalition continued to cast doubt on the effects its actions were having on ordinary Syrians on the ground. Although overall casualty events fell by 35% on July to 113 incidents, 88% of all those tracked in August were in Syria. Out of the 113 events, Airwars currently assesses 72 as likely carried out by the US-led Coalition. Between 464 and 713 civilians are estimated to have died across these 72 Syrian events – compared to a minimum of 296 likely killed during July across 85 events. Most of the reported incidents were in Raqqa city – 90 per cent – where likely civilian deaths more than doubled on July. Current assessments show that between 433 and 643 non-combatants died in Raqqa city alone during August, compared to a minimum estimate of 213 deaths in July. In contrast with West Mosul where most civilian casualty allegations were contested, a high proportion of Raqqa actions have been attributed to the Coalition with some confidence. Only the Coalition conducts air and artillery strikes on the city, in support of lightly armed and armoured SDF forces. Despite a public outcry at the mounting death toll in Raqqa – including concern expressed by the United Nations – alleged Coalition actions have continued to have a significant impact on families trapped in Raqqa. During the course of the month, a minimum of 74 children were likely killed – a rise of 30% on July. Additionally, at least 62 women likely died – more than double the reported deaths in July. Official strike data from the Coalition confirmed a dramatic rise in the bombardment of Raqqa. A total of 1,291 air and artillery strikes were publicly reported during August – up 85% on July. Some 2,432 targets were reportedly bombed, a 67% hike on the previous month. Given this significant increase in military attacks, it was little surprise that our researchers also monitored a major rise in reported casualty events – with all publicly available evidence pointing towards the Coaltion being responsible. The first of these large scale casualty events occurred on August 1st when between 10 and 50 civilians including three families reportedly died with dozens more wounded in an alleged Coalition airstrike. The raid took place on the Al Bousraya area of Raqqa according to multiple local sources. Raqqa is Being Slaughtered Silently reported that the Coalition struck a building holding 50 civilians. Among those killed were Hamada Al-Saeed Al-Hamzawi and three members of his family, along with Ibrahim al-Kaba (Abu Muhannad) and his wife. 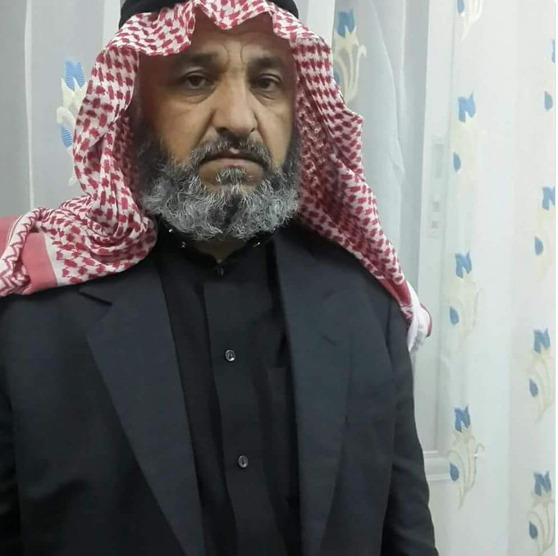 The activist Ahmad Al Shibili later added that the bodies of four members of the al A’jali family were recovered from the rubble. Raqqa’s Bedo neighbourhood also came under repeated and increasingly ferocious fire. On August 20th, between 23 and 50 civilians died in what Step News referred to as “one of the largest massacres since the start of the battle”. Multiple local sources blamed Coalition strikes for hitting a residential building near the Na’im roundabout. 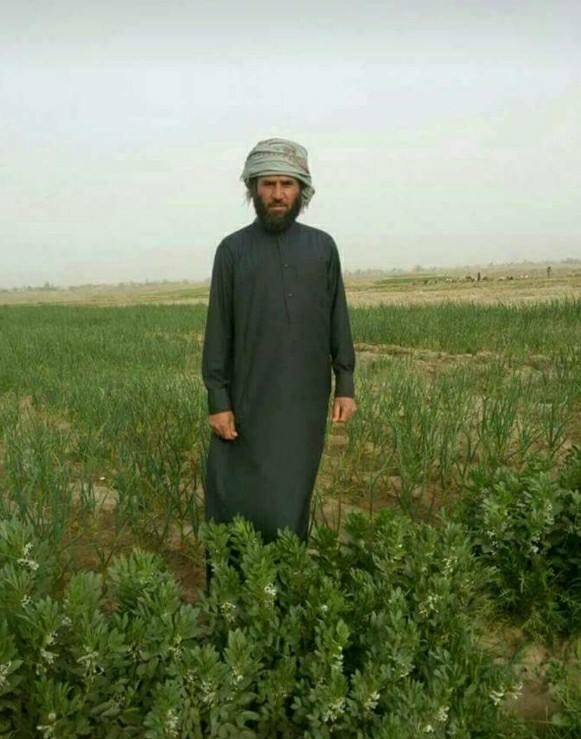 Raqqa is Being Slaughtered Silently named 30-year-old Met’eb Al-Hammoud and 26-year-old Ziad Fawaz Hindawi as victims. Most sources predicted the death toll could rise given the number of people still reported trapped under the destroyed buildings. There was no respite for the residents of Bedo. On August 21st more civilians in the neighbourhood reportedly perished in alleged Coalition airstrikes. According to the Syrian Press Centre, a residential building was again hit and completely destroyed. The Syrian Observatory for Human Rights said the victims included 19 children and 12 women. Local sources named three girls from the Abdul-Sultan family among the dead. Children (Retaj Ahmed Abdul-Sultan, Islam Ahmed Abdul-Sultan and Hadeel Ahmed Abdul-Sultan), killed in an alleged Coalition raid on Bedo, Raqqa, Aug 21st. 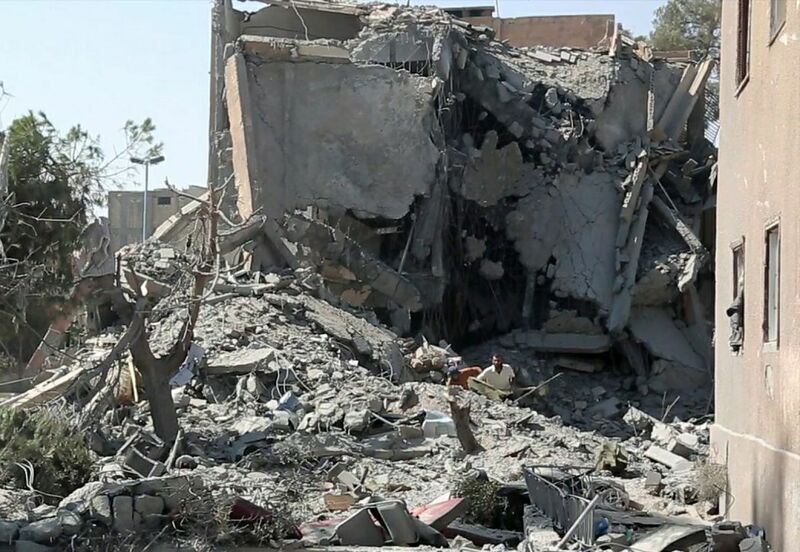 Elsewhere in Raqqa, the devastation continued. On August 22nd, a further 40 to 50 civilians were claimed to have died and 100 more wounded when alleged Coalition air and artillery strikes hit the Malahi district. A four-storey apartment block was reportedly destroyed. Local sources called the event a “horrific massacre”. Following the complete capture of Mosul by government forces a month earlier, August saw reported civilian deaths from Coalition actions in Iraq continue to fall. Overall, we tracked 15 claimed casualty events, a 25% decrease on the previous month. Only two of these 15 events are currently assessed as likely carried out by the US-led Coaltion. Just six civilians reportedly died across these incidents. The month also saw a 61% fall in the minimum number of civilians reported killed in contested events. Between 272 and 714 non-combatants were said to have died in 13 such incidents. Across all categories – ‘fair’, ‘weak’ and ‘contested’ – between 278 and 720 civilians were claimed killed by the Coalition in Iraq during August – compared to an estimated range of 850 to 865 deaths in July. Moreover, pre-battle warnings that up to 50,000 civilians were still trapped in the city appeared inaccurate, and the Tal Afar battle was relatively uncomplicated, unlike Mosul where large numbers of civilians remained throughout hostilities. Even so, between August 19th and 22nd as many as 300 civilians were reported killed and injured in the shelling of Tal Afar. Local medical sources provided information on the lives lost, reporting that mostly women and children were the victims. However, it was unclear who was reponsible, with JBS and other sources referring only to “air and missile strikes” and an “aerial bombardment”. In one August 21st example, 30 civilians died in shelling on Tal Afar according to local media. Just one source – Omara Al Halbusi – blamed the US-led Coalition, accusing it of “destroying houses” with “civilians inside”. Other sources referred only to “artillery”, “shelling” and an “aerial bombardment”. The final event Airwars tracked in Tal Afar during the month was on August 27th, when dozens of civilians were reportedly killed in airstrikes. Again it was unclear who was responsible. A graphic tweet by @AEJKHaill blamed both the Coalition and the Iraqi army, while activists Omar Al Habusi and Abdulaziz Afganu made an “urgent” call to “international human rights organisation” to expose what they described as a “heinous crime”, claiming that victims were displaced people and that Iraqi government forces had broken the laws of war. After an increase in civilian casualty events in July allegedly involving Russia in Syria, claims against Moscow’s air assets were once again down. Throughout August, Airwars tracked 36 alleged Russian incidents – a fall of 45% on July. This was the lowest number of monthly allegations attributed to Russia since the start of its campaign in Syria in autumn 2015. Raw figures indicated that across those 36 events, between 97 and 164 civilians were reported killed in alleged Russian actions. However it should be noted that these numbers are unvetted, and should therefore not be directly compared to the Coalition estimates in this report. The majority of allegations against Russia (42%) occurred in Deir Ezzor province, followed by Hama (39%). Just five alleged incidents were reported in Raqqa province – a fall of two thirds on July. For the eighth consecutive month, alleged civilian casualty incidents attributed to the Coalition in Iraq and Syria outweighed those attributed to Russia in Syria. Continuing this year’s trend, in August there were three and a half times as many Coalition as Russian events tracked by the Airwars team. “Most incidents were reported around Deir Ezzor and Hama where IS is in control,” says Abdulwahab Tahhan, an Airwars researcher who monitors Russian actions. “Among the events, were reports of several strikes on civilian cars and camps for internally displaced persons. Additionally and more worryingly, there were some allegations of the use of phosphorous bombs in Hama.